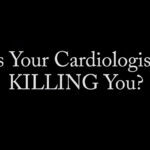 In this video, cardiologist Dr. Jack Wolfson tells you exactly what you need to know about myocarditis. What myocarditis is and how it impacts your health. 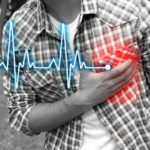 Symptoms of myocarditis and common tests to diagnose the condition. Natural treatment and prevention methods for myocarditis. Running Time: 8 minutes, 32 seconds. Hello and welcome to my presentation today. I’m Dr. Jack Wolfson of The Drs. Wolfson and today I’m going to be talking about myocarditis, a topic that is very near and dear to my heart. 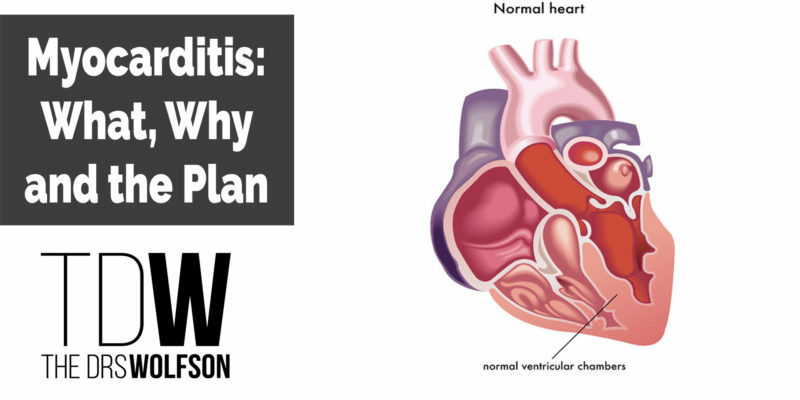 Myocarditis: What, Why and What is the Plan? 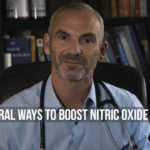 Once again, I’m Dr. Jack Wolfson, board-certified cardiologist and author of the Amazon best-seller, The Paleo Cardiologist: The Natural Way to Heart Health and I’ve got some fantastic information to you today. I practiced in the hospitals for 18 years. I saw the sickest of the sick. Angiograms. Pacemakers. All that fancy hospital stuff. I left that to start my own practice in 2012. All holistic cardiology. But today I want to teach you about myocarditis. That literally means heart muscle inflammation. And we can see here on this drawing that we’ve got the inner layer of the heart, called the endocardium, which touches all the blood. Then we have the heart muscle contractile tissue called the myocardium and then over here we have the pericardium that surrounds the heart. Its kind of like a sack that encases the heart. All these areas can be inflamed. All of them can be inflamed at once. One layer, two layers, all three layers – you name it. But today we’re going to try and focus on myocarditis. Inflammation of the heart muscle itself. Now, here’s that they’ll tell you are the causes of myocarditis. They would say it’s an infection. Whenever doctors don’t know what it is, we blame it on a virus. But it rarely is a virus. But since we’re not trained to look for causation, we’ll say it’s a virus but once again, it’s rarely a virus. It’s all how your body responds to a virus and how the body attacks the heart if that is the case. But once again, it is rarely a virus. It’s more commonly going to be a drug pharmaceutical side effect. That’s certainly a possibility. Chemotherapy. Radiation for cancers. These can cause inflammation as well. 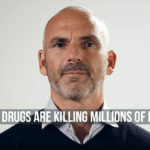 The pharmaceuticals can do it as I said but also illegal, illicit drugs – cocaine, crystal meth, heroin -those things are certainly famous for drug-induced myocarditis. Alcohol would also be a causative factor. Auto immune. These different conditions that we label – like rheumatoid arthritis or lupus. These are all because the body is attacking itself and we need to figure out why. Hashimoto’s thyroiditis would fall into that category and Hashimoto’s and thyroid disorders are also on this list of causes of myocarditis. The two main things that would be causing myocarditis are environmental related factors and food-related factors. So, when you eat food that is not our ancestral food, when you are in a toxic environment, you will suffer the consequences. Also on this list but a known side effect of course would be vaccines. Symptoms related to myocarditis. We’ve got chest pain would be the most common one. Shortness of breath may be another. Symptoms and signs of congestive heart failure – swelling of the legs, filling up of the lungs, filling up of the abdominal cavity. And the heart rhythm issues. Whether it’s atrial fibrillation, extra beats called PACs, PVCs or even ventricular heart rhythms can do it. Sinus tachycardia where your heart is just racing…bum…bum…bum…bum…bum…bum…bum. That can also be a sign that you have myocarditis. Testing for myocarditis. This is what the typical doctors do. ECG, or known as EKG. Echocardiogram also looks at the heart muscle itself by ultrasound technology and looks for fluid around the heart. That can be consistent with myocarditis. And then finally blood tests that are common to look for heart muscle damage as you will see in myocarditis. CPK. Troponin i are two common tests there. Their plan – PILLS, PILLS, and PILLS. That is what they’re going to do. They’re going to put you on the pills and the reality is that the steroids, anti-inflammatories, all these things may be necessary in the short term so here’s my disclaimer. I’m not just telling you to follow my advice and don’t listen to your doctor. Discuss these things with you doctor. Use my information as exactly what it is: information. Now what are the tests I like to do. I like to do the most advanced testing in the world. I like to use a company like Vibrant America and there is others like it that look at advanced lipids, markers of inflammation, oxidative stress, Omega 3s, vitamin D levels, advanced thyroid and thyroid antibodies, advanced blood sugar assessment. We want to look at male hormones, female hormones. We want to get a really in-depth picture as to what is going on with you. Next test I like to order is the Wheat Zoomer and this is also from my friends at Vibrant America. And there’s other companies that do the testing as well and this is looking for leaky gut. Are things getting through the intestinal lining into the body causing damage. That company also looks for all these different antibodies showing if you are sensitive to gluten and the components of gluten and the non-gluten components of wheat. Genova, Vibrant, they also look at tests that look at intra-cellular vitamins, minerals, heavy metals, markers of digestion, glutathione for antioxidant, CoQ10 levels, proteins, fats, digestive things, good bacteria, bad bacteria, all that stuff is in there. Food panels can be very important also as far as hey maybe some food sensitivity or food allergy stoked this episode of myocarditis. And then we’ve got stool test also that looks for digestion, looks for bad bugs there, good bugs there. That’s what we want to get an assessment of. Now finally – the plan – the Wolfson Way. This is really, really important and this is beneficial for anybody and everybody. Any condition. Go Paleo. Eat organic food. Eat like our ancestors did. Eat wild seafood. Eat free-range, grass-fed meats. Eat tons of vegetables every morning. I start off my day with a greens drink. So should you. Follow the diet of our ancestors and you’ll be successful. Our ancestors also went to sleep with the sun down and woke with the sunrise. I don’t make the rules. It’s just what we’ve done forever. When our ancestors woke up they spent the day in the sun. Number three. They spent the day in and out of the sun and they were naked. When is the last time that you were naked in the sun? Please do not email me and tell me your stories, just think about that up in your head. When is the last time you were naked in the sun? Get naked in the sun. The energy from the sun coming into your heart to work magic. Get active. Get outside. Hike. Bike. Walk. Do gardening. Do yoga. Just get outside in nature! Get grounded. Walk stand barefoot whenever possible. Get hydrated. Drink high quality water that’s very, very important. We only drink out of glass. Get chiropractic care. From the brain to the heart, and everything in between, that is all the area of expertise of the Doctor of Chiropractic. Just trust me on this one. I could explain it for days. The Doctor of Chiropractic is the person you need to go to to help with you heart. Get away from environmental toxins. Quite simply everything you bring into your house, is it toxic or not? Laundry detergents, fabric softeners, dry sheets. The new mattress. The new flooring. Colognes. Perfumes. Skin care products. Deodorants. All that stuff is poison. Think about everything you bring into your house. Is it poison or not? If not, don’t bring it in. It all causes damage. Electromagnetic fields cause damage. Pesticides cause damage. Vaccines cause damage. Be aware of that. Get tested. Get the most advanced testing in the world and find out what you are deficient in. We’re going to find the answer. You’re going to find the answer if you work at it. You’re not going to find the answer from the average medical doctor. I assure you. Get happy. Live. Laugh and love. The Wolfson Way. So that is it. If you like this video, please subscribe. I’ve got ton of good videos. I’ve got a lot more content coming out. I would love for you to get a copy of my book. Amazon best-seller. The Paleo Cardiologist. 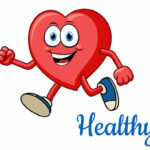 You’re going to love it and you are on your way to getting healthy and happy with myocarditis.